Build up your coats to achieve required thickness. Avoid hot, direct sun when applying. Product stays soft, flexible and may have some tackiness, not meant as a walking surface. You can re-coat when it's dry to touch and make sure there is no uncured material underneath. Apply material until you use up the required amount. For larger areas, pour out and spread around with a roller or squeegee. If corrosion is present, use MetalSafe Sealant. 21036 - Liquid Rubber Waterproof Sealant Medium Grey 8 oz. 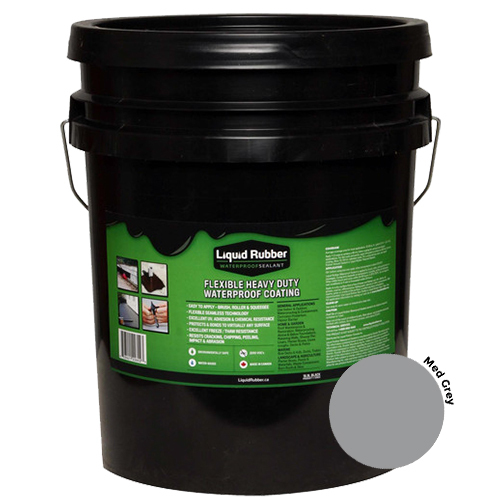 83016 - Liquid Rubber Waterproof Sealant Medium Grey 32 oz.